The Vietnam Trade Information Portal (VTIP) was officially launched yesterday by the General Department of Vietnam Customs (GDVC) with the help of the World Bank (WB), in order to provide the business community with a reliable one window information source on relevant legal regulations and categorisation for both export and import purposes. The Law on Amendments and Supplements to Several Articles of the Penal Code and five other laws were made public by the Presidential Office a at a press conference on July 12. 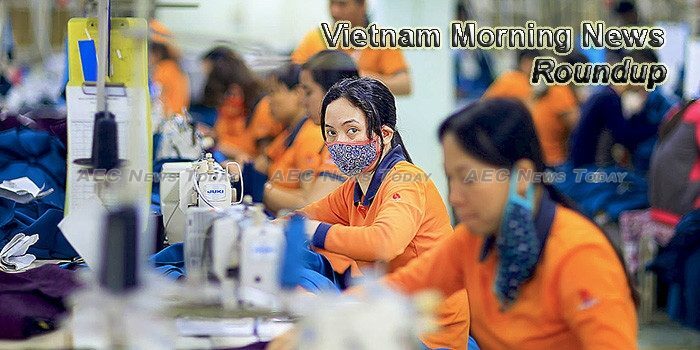 The annual growth goal of 6.7 per cent is likely to remain beyond reach despite an improved economic performance in the second half of the year, says Nguyen Duc Thanh, Director of the Viet Nam Institute for Economic and Policy Research (VEPR). Potential for cooperation in developing transport in general and seaport in particular in Vietnam has been introduced to representatives of the Dutch government and enterprises. As Vietnam emerges from international isolation and opens its markets, the expanded commercial trade offers significant opportunities for foreign transnational transportation and logistics companies, reports the Oxford Business Group. Vietnam shipped to the US 16 billion USD worth of commodities in the past five months of this year, up 10 percent year on year while its imports from the partner reached 3.94 billion USD, up 26.3 percent. The Viet Nam Food Association (VFA) has set the target for rice export at 5.7 million tonnes this year, up 800,000 tonnes from 2016, amid rising global demand. The Vietnam Chamber of Commerce and Industry (VCCI) has proposed the Ministry of Industry and Trade (MoIT) remove unreasonable business conditions relating to a decree on rice exports. The Vietnamese export of fruit and vegetables has risen considerably in recent years. A few days ago Vietnamese lychees entered their harvesting period, but because of unfavorable weather conditions this year’s output has been reduced. Russian automobile maker Sollers plans to start assembling UAZ cars in Viet Nam in 2018, said Vadim Shvetsov, director general of Sollers, at the International Industrial Trade Fair INNOPROM 2017 in Russia. As the number of foreign tourists continues to grow at a high rate, travel firms have been advised to disperse travelers to many tourism sites to avoid overloading. With an expanding room inventory and a lot of projects scheduled to launch in the near future, the competition in the upscale hotel market will start to heat up, especially in the five-star segment, according to the 2017 Vietnam Hotel Survey released on July 11. Despite their apparent popularity, it seems people are going to new modern retail complexes for the experience, not the shopping. As many as 180,079 documents of 12,683 businesses were processed through the national one-stop-shop (OSS) mechanism by the end of June 2017, representing year-on-year rises of 107 percent and 70 percent, respectively. FE Credit is leading the consumer finance market with $1.4 billion worth of loans provided in 2016, accounting for 48 percent of market share. Eighty-six per cent of firms listed on the Hà Nội Stock Exchange (HNX) posted profits during the first quarter of this year, the northern bourse has announced. Ho Chi Minh City plans to step up enforcement against smuggling and trade fraud to cope with the increasing number of violations, especially at Cat Lai Port. The expanded Thac Mo hydropower plant in the southern province of Binh Phuoc connected to the national grid from July 11, according to the Electricity of Vietnam (EVN). The Mekong Delta city of Can Tho will open more direct domestic and international routes, targeting promising markets in Southeast and Northeast Asia. Dung Quat Economic Zone and industrial zones in Quang Ngai Province attracted eight projects worth US$2.81 billion in the first half of this year, according to the provincial People’s Committee. The industry and trade sector in 15 cities and provinces in the central – Central Highlands region registered a good growth rate that is higher than the national average in the first six months of the year. A conference to promote tourism, investment and trade in three Laos provinces, Savannakhet, Khammouane, and Bolikhamxay, will be held in HCM City on July 19.